Kingstone Brewery01291 680111work BreweryAt Kingstone Brewery, our passion is real beer. Uncompromised by the inflexibility of modern manufacture, we choose to champion a hand brewed and bottled beer using only mineral water and the finest ingredients. The beer is unfiltered and bottle conditioned to develop a finer bubble and a more subtle texture. We hope you enjoy it as much as we do! At Kingstone Brewery, our passion is real beer. Uncompromised by the inflexibility of modern manufacture, we choose to champion a hand brewed and bottled beer using only mineral water and the finest ingredients. The beer is unfiltered and bottle conditioned to develop a finer bubble and a more subtle texture. We hope you enjoy it as much as we do! Kingstone Brewery is located in Tintern and is open daily, all year round from 9 am to 4.30 pm, except Thursday and Sunday. Visitors to our Brewery will have the opportunity to try the ales. You can choose an ale to accompany a ploughmans lunch which is served using produce from our garden overlooking the Wye Valley. 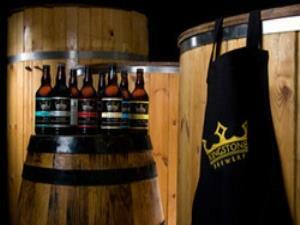 Kingstone Brewery is home to The Real Ale Shop, which has a selection of over fifty ales from all over Wales.